KDENLIVE is the free and open source video editor for Mac OS X, and there is related version for GNU/Linux. The non-linear editor does not only include video and audio effects, but also can export videos to DVD with chapters and simple menu. However, it does not import/recognize the 1080/60p .mts directly from Panasonic HDC-TM700. The 1080/60p 28Mbps .mts shot by TM700 camcorder is not AVCHD standard compliant, which makes it difficult for Mac users. Kdenlive edits all the formats supported by FFmpeg like QuickTime, AVI, WMV, MPEG, and Flash Video, but not the AVCHD videos, especially those from TM700. Aunsoft MTS/M2TS Converter for Mac is the recommend third party Mac Panasonic TM700 AVCHD converter, which supports TM700 1080/60p and 1080/50p videos, and converts the MTS files to HD videos like MOV, MP4, AVI, MPG, maintaining the 5.1-channel surround sound. 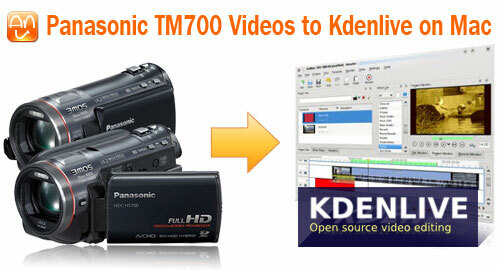 Here is the simple step-by-step guide for you to convert Panasonic TM700 1080/60p and 1080/50p 28Mbps MTS videos to Kdenlive supported formats like MOV, AVI, and MPEG on Mac. Step 1. Load Panasonic HD videos to Aunsoft MTS/M2TS Converter for Mac. Transfer .mts files from Panasonic TM700 memory card to Apple hard drive disk when the camcorder is connected to iMac/MacBook Pro via USB cable. Run Aunsoft MTS/M2TS Converter for Mac as the super Mac Panasonic MTS converter, and click the "Add" button to load .mts videos. Step 2. Choose H.264 MOV format. Click the "Format" option, and choose Adobe Premiere/Sony Vegas > MOV (AVC)(*.mov) as output format. The Mac Panasonic MTS converter will convert 1080/60p or 1080/50p MTS to H.264 MOV with the original video resolution. The output videos will be 1080/30p by default. Tips: If you want to change the frame rate or bit rate, just click the "Settings" button for detailed parameters. You may also choose to output WMV, MPG, or other profile like FLV as output format. Step 3. Convert Panasonic TM700 to MOV for Kdenlive. Click the convert button under the preview window, the conversion from Panasonic TM700 MTS to Kdenlive MOV starts immediately. Soon after the conversion, just bring the HD 1080p MOV videos to Kdenlive timeline, and edit with rotations, blurring, blue-screen and so on. The Mac Panasonic AVCHD converter also works for Panasonic AVCHD camcorders like HDC-HS250, HDC-HS60, DMC-ZS7, HDC-SD9, HDC-SD60, HDC-HS700, HDC-SD700, HDC-TM300, HDC-TM350, and so on. It helps you edit AVCHD videos in Final Cut Pro, Final Cut Express, iMovie, Adobe Premiere Pro, Avid Media Composer and other Mac non-linear editors. How to Import AVCHD MTS/M2TS to iMovie for Editing? How to Quickly and Easily Rip Extras from Blu-ray DVD? How to Hard-Burn Blu-ray/DVD Subtitles into a Movie on Mac?